This feels so familiar I may have seen it somewhere else. Oh well, maybe not. 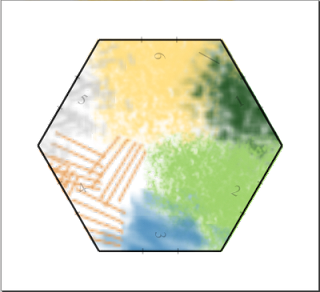 If you set each side of a hexagonal geomorph to a terrain type and then make a little chart so that it is more likely for similar hex faces to be rolled, you should be able to randomly produce a terrain that has some logic to it. I probably should have switched 5 and 6 around because trees on a mountain make more sense than crops. But . . . a computer could generate a random terrain with more sophisticated algorithms much more quickly. I like it. I've actually been doing a lot of doodling around with something like this for solo random hexcrawling. The system I messed with used a formula I got off Welsh Piper. 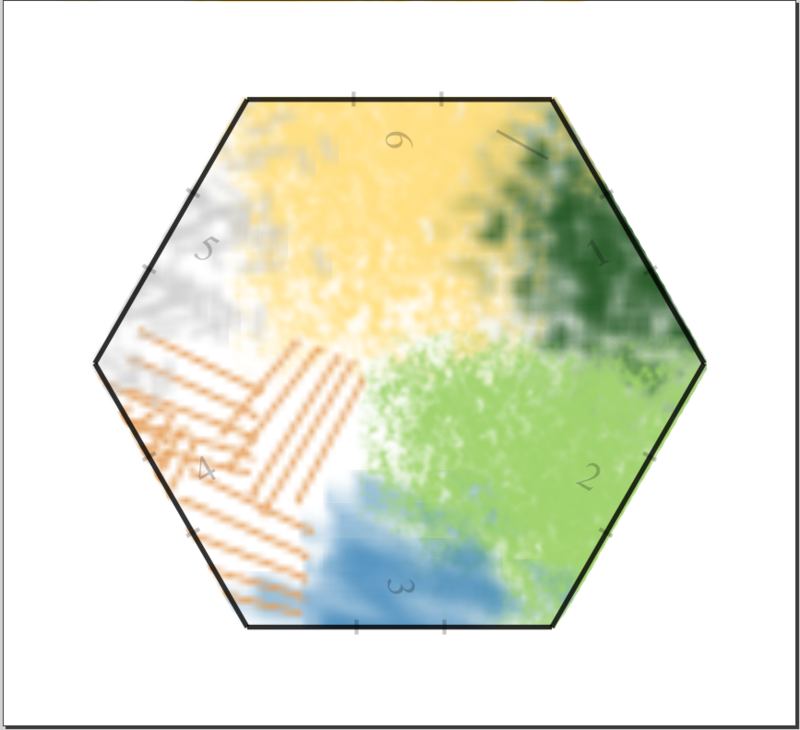 There, 25mile hexes have a primary terrain, and then subhexes within that larger hex are mostly that primary, some secondary, few tertiary, and maybe one wildcard. I like that system because you can play at a 1-25m-hex-per-day level (kind of like Barbarian Prince) or you can zoom in to 5 mile hexes and get more detail that's consistent with the "zoomed out" terrain. This "wheel" setup is useful for that, because the secondary terrains are the ones that flank the primary, then tertiary, then wildcard is the one directly across. I may tweak it since in my setup grasslands/farmlands are the same, just depending on whether you're in wilderness or civilization. Then I can include swamps or something. Thanks for the great simplification! It's a lot like a color wheel. Nice take on the idea though. On the other hand, nah! But swamps. Really. make grass and crops the same terrain, or maybe make grass adjacent to a settlement into crops or something. Neil - that's the Welsh Piper thing I was thinking of. Been a while since I cribbed it for my own use. It's a similar idea, but I like this wheel presentation with the increments better. I'm still thinking about it today. Rorschachhamster - yeah, no swamp and no desert. I'm thinking about that myself. Still haven't thought of a good way to do it, because I LOVE the diagram being a hex. But I have more than 6 terrains... a quandary. Thanks for the comments, yep I did read that Welsh Piper post. I liked the way his hex would have a central type of terrain and then varied around the edges, but system as a whole was a little complicated for my taste. Omega, you could have hex "Terrain Wheels" for different climates or regions. So a more southerly or wet region might have swamp but no desert and vice versa. Or, you might just interpret results a little as a designer, i.e. areas with a lot of water/grass/water alternating are swamp. Rough patches far from any water could be desert.